New students arrive at Oxford University with a wide variety of skills and knowledge. 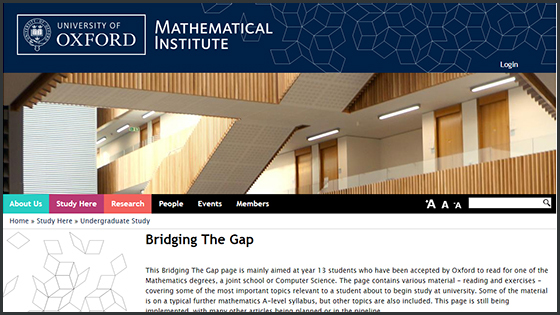 The MPLS Bridging the Gap programme is a week-long residential course held before the beginning of term to help selected new students get up to speed in areas of maths and study skills before they start university. When feedback showed there was an appetite and need for this teaching among a much wider group of MPLS students than the limited places on the residential course allowed, staff translated course materials into an online format. The uptake has been strong - 72% of all freshers reading Chemistry, Earth Sciences, Materials, Engineering and Physics access it (2014) - and the online course is flexible enough to meet every individual's needs. The online course is open to all students and so more inclusive. Because the sequence in which students will encounter maths topics during their first year will differ according to their main subject of study, the online course enables them to study the topics in any order. In contrast, all students on the residential course take the topics in the same order.